Cathy and I recycle; we don't do it to the best of our abilities, but we do the obvious, like bottles, cans, and bags. We bought shopping bags which are left in the trunk for our shopping trips, including two insulated bags for our refrigerated items. It is a lifestyle choice we've made, and it's something Cathy and I do together. Just a point about grocery bags. A vast majority of plastic bags are recyclable, but there seems to be a popular idea that plastic bags are evil, environment-destroying menaces. 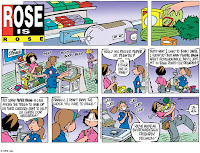 For example, the September 7th, 2008 issue of Rose is Rose says plastic bags are bad . Plastic bags don't have to end up in the landfill. You have probably noticed the "Recycle your bags here" bins at the grocery store. That's because plastic bags are readily recyclable (see this eHow article). And, by the way, most paper bags I've seen at grocery stores are from recycled sources, too, so you're probably not asking for trees to give up their lives for you. Cathy and I use our own shopping bags because we don't want more bags to be produced. However, don't feel guilty using the bags, so long as you recycle them. Good points Lee - if you reuse the bags for other purposes like taking lunch or carrying things it definitely helps. You are exactly right, Lee - on both accounts. My 12 year old granddaughter has just started her own business selling the top of the line, thermal insulated bags by the reknown Kold-to-Go corporation in Georgia, USA. She has also included a link on her "Links I Like" page which takes you to an astounding site on crafts for recyling those darn plastic bags. I encourage you to check it out. As a Christian myself, I am somewhat dismayed about the number of Christians who are afraid of "Going Green." They are fearful of becoming left wing extremists or something if they start down the green path. If they only realized God's pleasure in seeing His planet valued and protected. Well, Lee, thanks for spreading the word and God Bless You.